After quitting the Blue Caps, Cliff Gallup worked for the Chesapeake, Virginia public school system for over thirty years. He never toured or recorded again, but he played guitar every day and moonlighted regularly with local bands. In fact, forty-eight hours before he passed away of a heart attack, he was on stage playing a gig in Norfolk with a band called the H-Los. Cliff Gallup could have used his six-string skills to achieve incredible wealth and fame, but he didn’t. He played guitar purely because it was fun, and that’s more important than having a platinum record or seeing your face in a guitar magazine. Nevertheless, a player as good as Cliff Gallup couldn’t stay out of the spotlight for long. 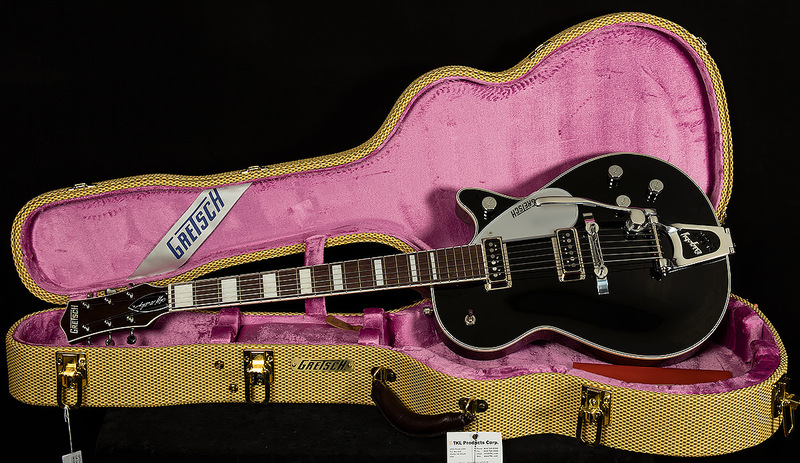 Some people have such incandescent talent that obscurity eludes them, and the fine people at Gretsch have done his legacy justice with this Cliff Gallup Signature Duo Jet. The neck has that classic Gretsch feel thanks to its classic “U” profile, 24.6″ scale-length, vintage-style frets, and 12″ radius. It also sounds just like a vintage Gretsch because of its stellar Dynasonic pickups, vintage-correct aluminum bridge, and choice tonewoods. Frankly, it doesn’t sound too far from the Duo Jet Mr. Gallup played on those classic Gene Vincent recordings! So, the Wildwood team is proud to showcase this Cliff Gallup signature model, both because it has the sort of sound that will inspire you endlessly and because it reminds us that finding joy in your instrument is the most important thing a musician can do.